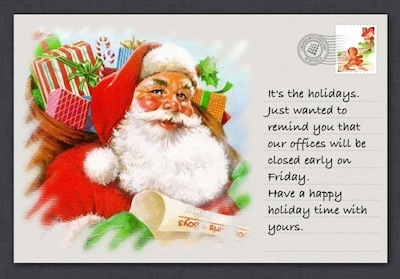 A few folks still use the ‘online’ card services to send greeting cards. But, it’s success has been going off a bit as poeple become more concerned about clicking on long weird looking links in emails. Instead, the days of fancy emails or small images attached inside of emails are coming back. Internet speed and capabilities of email applications makes it acceptable to get a few key colorful emails from time to time. This is great news for folks like us that are in a big hurry… all of the time. 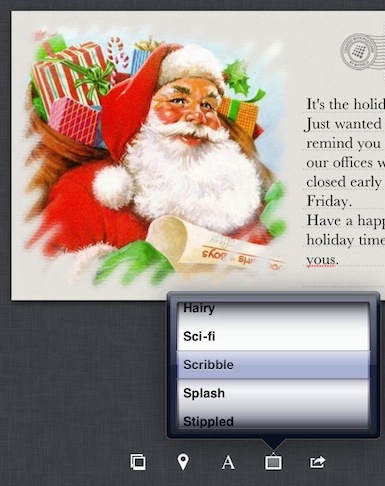 We have very nice apps that we covered before which enable us to create two sided cards and postcards right on our iPads. These can be printed and mailed with ease. Even easier is “Postcard“. 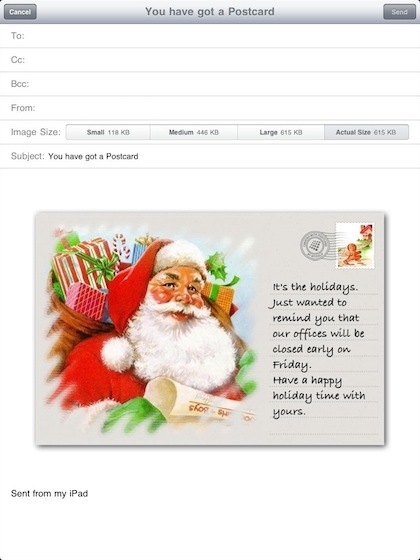 This iPad/iPhone universal app does one thing VERY well, it allows you to create single sided postcard looking images that you can use or share out in a wide variety of ways. Images from your photo album are added by tapping either the main image area or the ‘stamp’ image then choosing from the available photos. 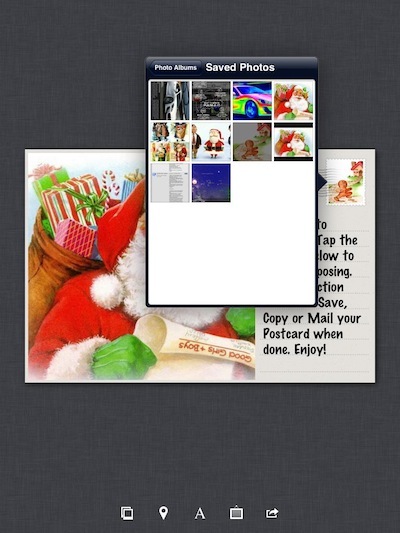 Be warned, the images can not be resized or moved on the PostCard – they appear as they are, centered with edges cropped. 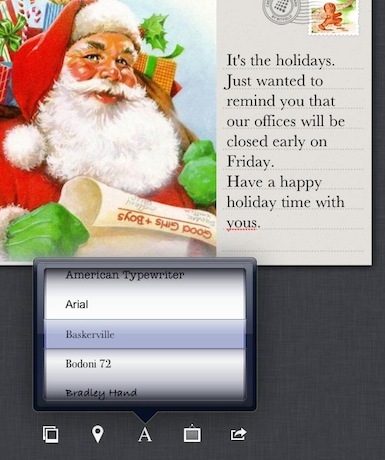 The text on the right of the card is edited by taping the text which brings up the keyboard to type your message. Since this is an electronic image, there is no need to enter a ‘send to’ postal address. The font is adjustable via the ‘A’ button at the bottom of the page. The whole text box carries the same font. 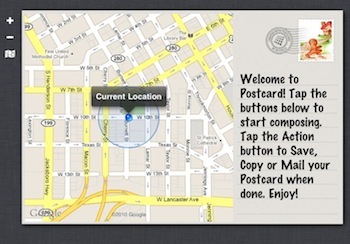 A nice added feature of Postcard is the ability to change the edging around the image. From the pop up, frame like icon, just choose one from the dial. Like the font, these can be changed later if you change your mind, they are not frozen or locked. The all important ‘sharing’ has a nice list of options. PostCards aren’t the type of thing you would normally share directly to Facebook or Twitter so they are not options. 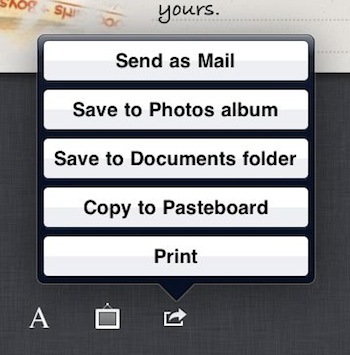 Sending via email, saving the image to your photos or documents folder and copy to your Pasteboard to paste into a document are just a simple tap. Choosing to ’email’ inserts the image as a single file into a new email. You can send the image to one or many people with cc and ‘blind’ cc. The image can be sent in a variety of sizes for those clients/friends that have limited email sizes. The smaller size is great for sending to friends that check their emails on their smartphones. Party invites or directions to a place just got much easier. You can choose the ‘Pin’ button to have an image of the area and a location ‘pinned’ for other people’s quick reference. Zoom in/out via the ‘+’ and ‘-‘ buttons on the left. If your looking for the area showing road names and text about the key landmarks, choose the little ‘map’ icon to the left. This can be toggled back and forth if you change your mind. 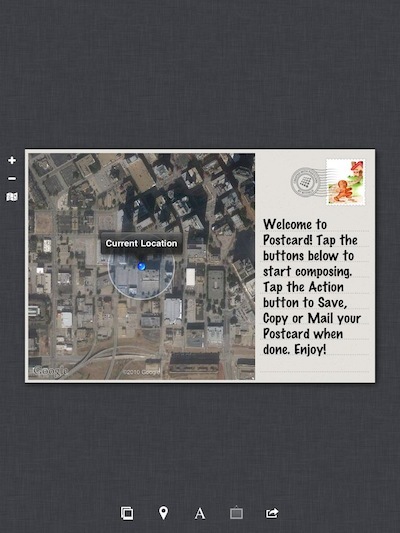 The Postcard app really does keep it simple and due to that is much more usable for those quick communication needs.